It turns out the fire at the Deutsche Bank was sadder than I knew. 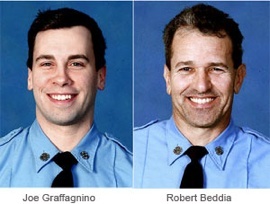 Two firefighters died there yesterday. It seems horrible that two people died for an empty building that was going to be pulled down anyway. Although I guess the thinking was, the fire could spread to non-empty buildings that are not going to be pulled down. How awful though. How on earth could that happen? They ran out of oxygen. How does that happen?? Did they get lost? Seriously. It wasn’t an out of control raging inferno, and people were all around. How did it happen? Not a criticism of them, by the way.